Crude News Trading and Investing Revealed: Why Crude Oil prices are crashing? Revealed: Why Crude Oil prices are crashing? Has the recent crash in Crude Oil price left you wondering what it means to the global economy and you? This article might help you understand, Read On! Driven on the back of rapidly increasing demand worldwide in the mid 2000's, majorly from China, Crude Oil rallied from under $25 a barrel in 2000 to around $150 in mid 2008. And then came the crash that took it to under $35 in just few months and then with the recovery seen in the global economy, Crude Oil prices rallied back up to around $114 and moved around $100 for few years until now. Crude Oil prices have fallen from $107 in June, 2014 to around $54 in December, 2014 which means more than a 50% drop in just 6 months! Lets try to understand what caused this fall. As studied in economics, price of any commodity is driven by two forces: Demand and Supply. 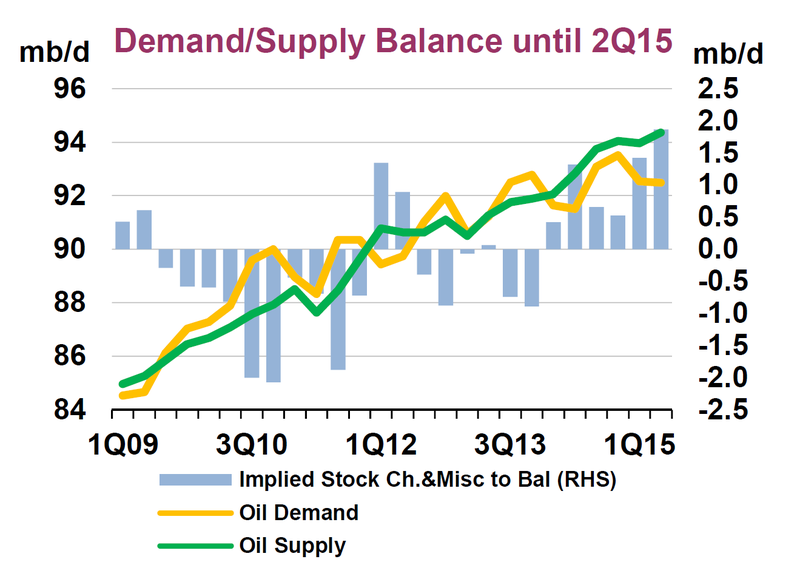 Let's see what changes have come in Demand and Supply of Crude Oil. From the first line chart, you can see how supply has become more than the demand. 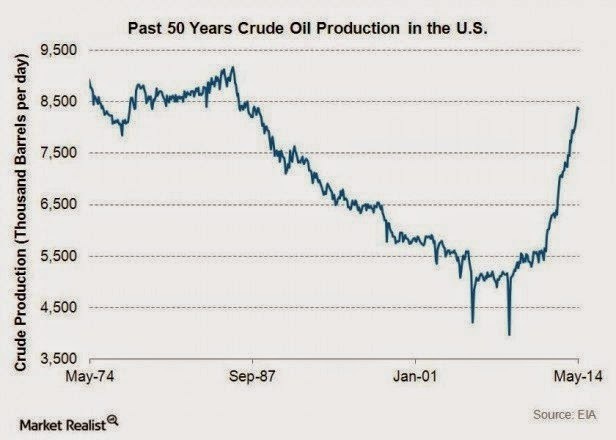 The above chart shows the spike in Crude production in USA in recent years. Due to high prices of Crude, Oil companies in USA started to extract oil from Shale formations in North Dakota and Alberta's oil sands. Oil prices thus on back of more supply started drifting lower. The markets expected the Oil cartel known as OPEC to step in and cut down on it's production in November, 2014 as prices were falling dramatically. OPEC (Largely influenced by Saudi Arabia) did nothing. Saudi Arabia wanted Oil prices to drift lower so that the oil boom in USA could be controlled. Oil prices now are well below the cost of producing oil for many countries and for countries like Venezuela, Russia whose economy is largely dependent on Oil, this means disaster. 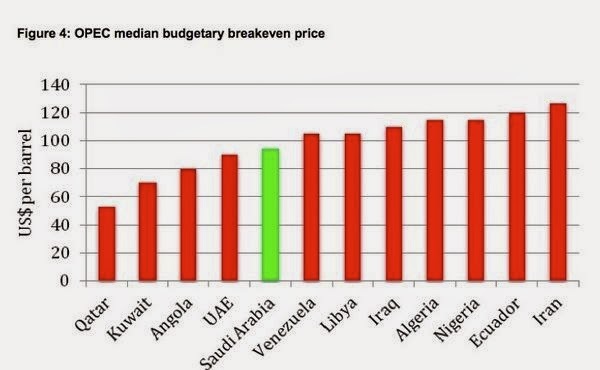 The chart below shows the breakeven prices for OPEC countries. Though Saudi Arabia has let Oil drop below it's breakeven price too, they have done it keeping in mind the large reserves they have that will help them bear these losses for years! In the process, they expect to force the US oil manufacturers to shut shop and thus they will regain the market share they enjoyed earlier. Keep in mind: Saudi Arabia is the largest producer of OIL in the world! In the 1980's when Oil prices had started falling, Saudi Arabia had cut down on Oil production but the oil prices continued falling which saw the Arabs lose out on a big chunk of revenue and market share as well. In short, the current scenario is a price war between USA (Where high oil prices prompted companies to start extracting oil from tough areas) and Saudi Arabia (Who wants to regain it's lost market share). Saudi Arabia does hope that Oil prices will stabilize later. So this was the story of increase in supply. China's growth is slowing down and it's alarmingly high pollution levels have prompted authorities to look at cleaner sources of energy. Infact, the whole world is now moving (slowly), towards alternate sources of energy. This is causing a slow in the growth of demand for Oil. Oil revenues make up 45% of the government's budget. Of Oil stays at $60 then the country's GDP will shrink 4.5%. Now Russia's currency Rubel is losing value at an alarming rate (Already down 50%) against the dollar. The central bank there hiked interest rates from 10% to 17% to stop people from selling Rubel but it has not worked till now. 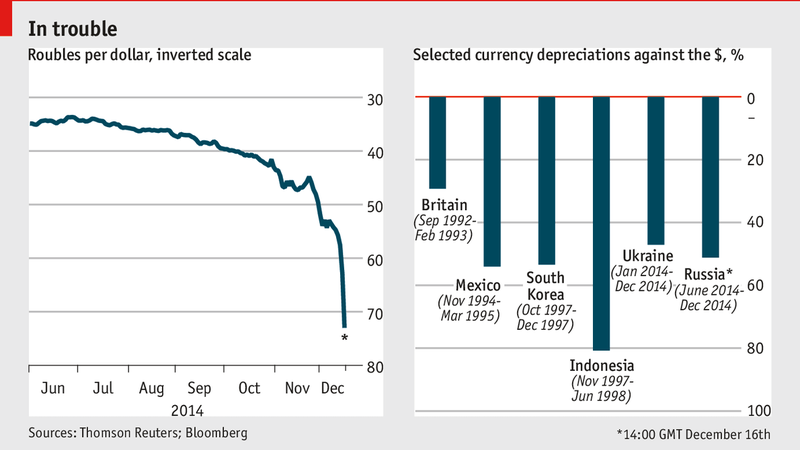 A large financial crisis is looming on the world's biggest country. With $740 Billion worth of forex reserves the country will just sit behind and watch the world run into chaos. If needed, they will cut down on social programs started after the Arab spring to counter the 15% deficit to the GDP that will happen if Oil stays near $60. It is a mixed scenario for USA. The Oil producing companies could head towards closure and the country will lose market share though authorities have indicated that the country continues towards it's plans of raising production by 700,000 barrels a day in 2015. Consumers will benefit from cheap gasoline prices. They will have more money to spend which will benefit the economy and will shift from small energy efficient cars to bigger ones. India is a net importer of Oil. Falling crude prices will do nothing but benefit the economy in a big way! The government is already taking advantage of this situation by reducing the fiscal deficit (That is why Petrol prices have not gone below Rs. 50). But the worry is that due to falling prices of Oil and the subsequent strengthening of the $, the rupee will continue to fall and this will hurt importers. IT & Pharma sector will benefit from a stronger dollar. With so many economies nearing a crisis with falling oil prices, investors will withdraw their investments in these countries and other emerging markets and put into safer assets like $, Gold, etc. Due to this, $ will gain strength globally and result in a weaker rupee. Will Oil Prices go up again? Our View: Eventually, Yes. How? Maybe some new war in some middle east country which will lower supplies. Maybe an economic miracle in China which will push up demand again. Maybe Saudi Arabia deciding that it's time to cut losses and thus cut production. We don't know the way but it will happen.